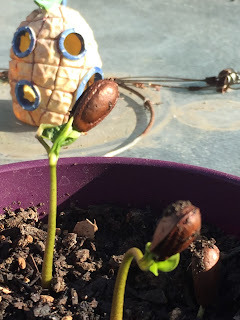 I tried to germinate Cherimoya seeds from organic Cherimoya I purchased at one of the food co-op. I thought the organic ones would not be so 'zapped' by whatever during the transport and its seeds are not sterilized. Of course, I have no clue at this moment about the agricultural import process and what all that sterilization would do, but that organic Cherimoya cost me $12 for less than 1 pound size. Tried a couple of different ways to germinate the seeds, but no reaction. I was very patient. 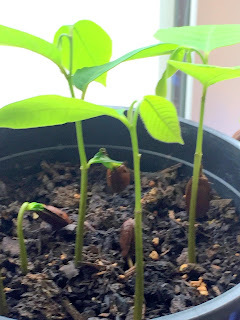 I decided to discard them and try the seeds from Cherimoya I purchased from the Asian market. 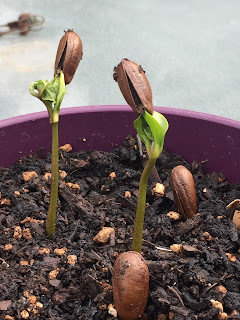 I know for one thing that Cherimoya seed takes a 'long' time to germinate - at least three months. And its worth the waiting. 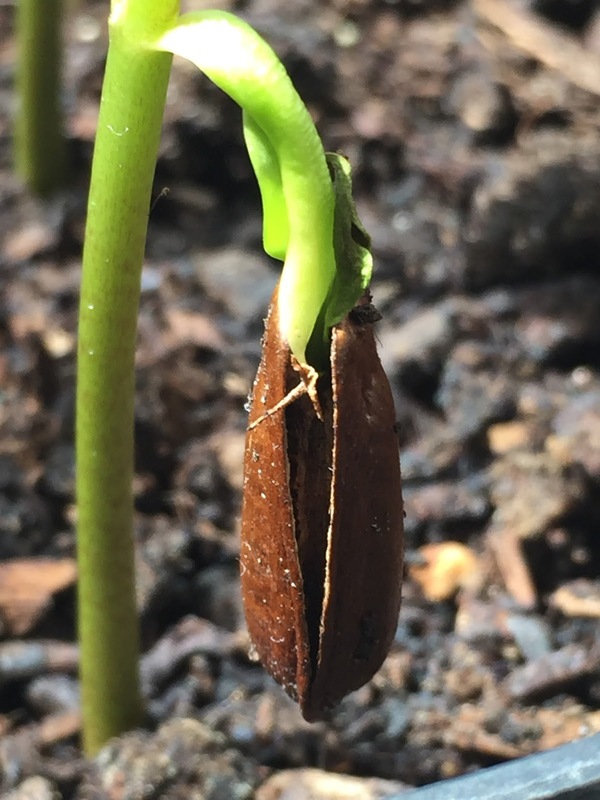 After planting the seeds in organic soil (placed inside the house - next to the patio door,) Cherimoya seeds finally sprouted.And I am glad I planted about 10 seeds. This is the sprouting of the first seed. I was so happy to see it. I saw it carrying this big o'le pod on its head. I was concerned that it is to heavy for it... so... I took it off to help out. Well. A big mistake. 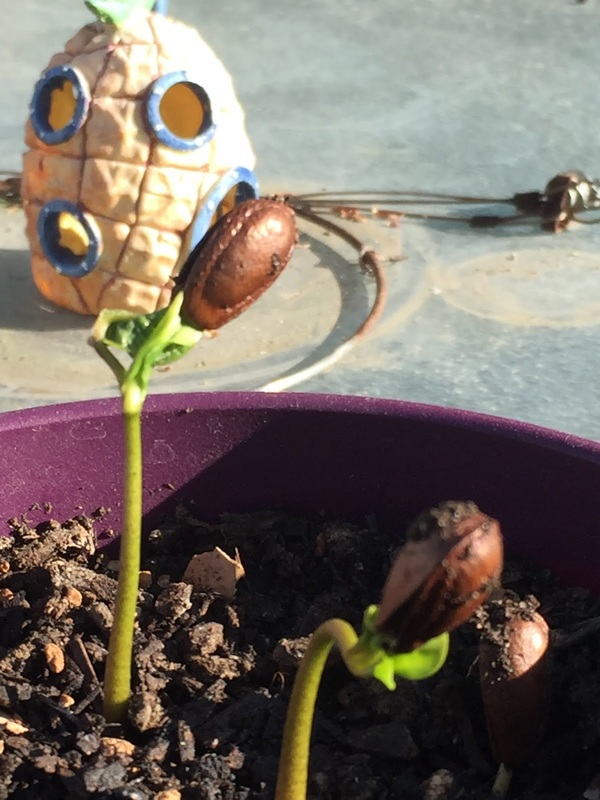 After watching a few others sprouting and weather got warmer, and I was too busy to tend to them a couple of days, those seeds sprouted with big pod on their head grew bigger and taller than the first one. Sad. So the 1st one remained dwarfed as is. Now I know the pod contains some kind of nutrients it needs to grow until it is all used up, and it drops off on its own. These ones followed after two weeks. They are quite strong to hold up those big o'le pods up. It can even hold it at an angle. Sorry, Number 1. 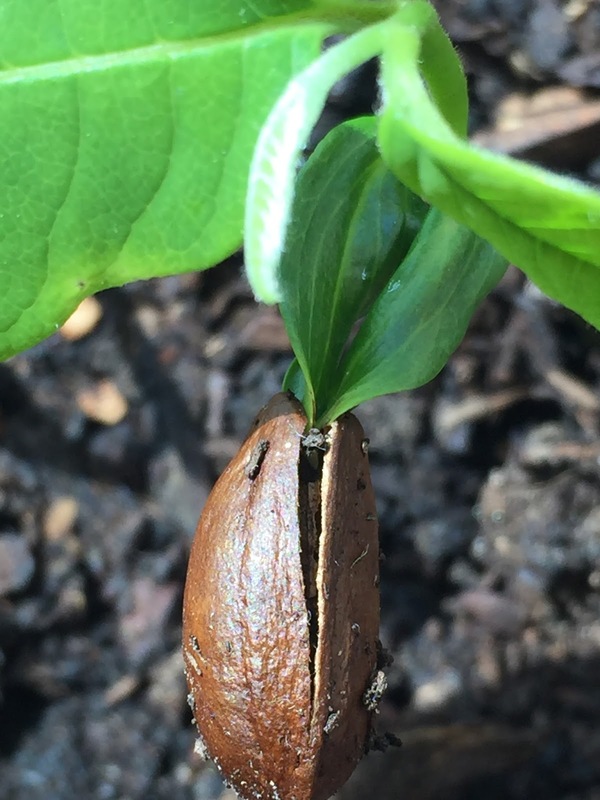 I removed your pod too early. A new ones coming through. These groups was taken outdoor. They seemed to know that they are not indoor, and they are not sure to poke their heads out or not. See how they seem to hang onto their pod. Their future is yet to be seen. 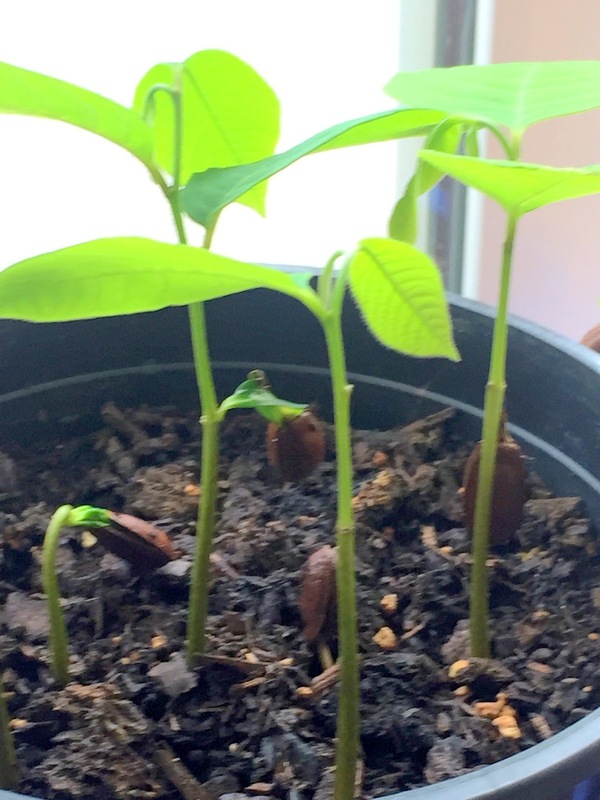 I don't know if they will grow and make it in Sacramento as the other Cherimoya I had a few years ago. That one died from frost bite one winter because I used the wrong cover to protect it during the winter. During the hot summer heat of Sacramento, all plants are protected by ground cloth/cover wrapped around awire cage on one side to prevent sun burn.